Mixmax Sequences allow you to customize bulk outreach campaigns. You write just one message, and we’ll automatically add information specific to each recipient, like name, company, salutation, product, etc. Create as many variables as you want! This quick video goes over how to create and use a new sequence. Go to the Sequences section of your dashboard and click New Sequence in the top left corner. Import a list from Salesforce, a contact list, or a CSV. Or, manually add email addresses by typing or pasting into the table. Drag and drop it in the window, or click CSV. Your CSV must follow our guidelines found here. In particular, all email addresses must be in a column named “Email” (no quotes, not case sensitive). Growth and Enterprise users can import recipients from Salesforce lists: just click the Salesforce button in the upper left. Search for any list of Contacts or Leads and we’ll import the records into your sequence, complete with all available fields. 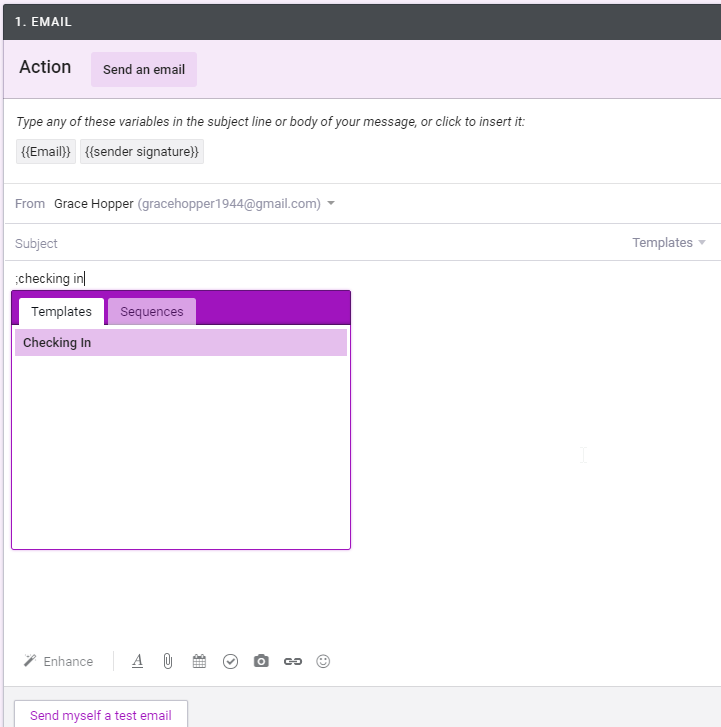 You can also add a recipient to a previously activated sequence directly from Gmail. Learn more about adding a recipient from the compose window. Growth and Enterprise users can add a list of Salesforce Contacts or Leads to a Mixmax sequence — all without leaving Salesforce. Head over to any list of Contacts or Leads, and click Add to Mixmax Sequence. To ensure perfection, verify imported data before you send. Learn how to connect Mixmax to Salesforce here. Just click any cell to edit recipient data before sending. This is a great time to make sure all first names are capitalized! Start with Stage 1. Once you add recipients to your sequence, you can schedule the exact date and time Stage 1 will send. Or, use our Smart Send Times feature. Click “Add another stage” underneath Stage 1 to add follow-up stages. Set the send conditions. Trigger: send if the previous stage is not replied, not read, or regardless. Number of days: how many days after the previous stage is sent to send. Type of days: weekdays or days (includes weekends). Select weekdays if you don’t want messages sent on a weekend. Send email, or Create a Salesforce Task (for Enterprise users). Learn how to add a Salesforce task to a sequence here. As a reply: select “Yes” to thread the stage with previous stages. Select “No” if you want to send the new stage as a unique thread with a unique subject line. Learn about subject lines in sequences here. The column headers from the recipients tab are automatically turned into variables you can use to customize your email. Type any of the variables in the subject line or body of your message, or click the variable buttons to insert them. Learn about sequence variables here. Choose your template from the Templates menu in the top right corner of the compose window, or type a semicolon ( ; ) followed by the name of the template. Add templates to your sequence to ensure your campaigns are consistent and super efficient. You'll get analytics for both the template and the sequence! On Growth and Enterprise, you can personalize each stage for each recipient. Click the recipient's email address on the left to personalize their messages, or edit the send times for each recipient. 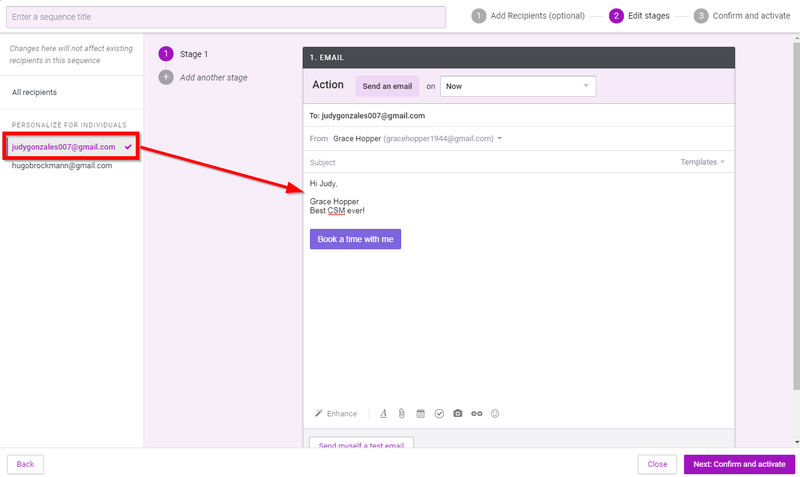 Click the “Send myself a test email” button at the bottom of a stage. Confirm everything looks good before sending to your prospects! On the Confirm & Activate page, you can adjust your sequence settings and activate to send. Opens and replies are always tracked for sequences. This is necessary to set conditions for follow-up stages. Choose whether to track clicks and downloads, log to Greenhouse ( Enterprise only) or Salesforce (Growth and Enterprise), or sync to Mixmax. 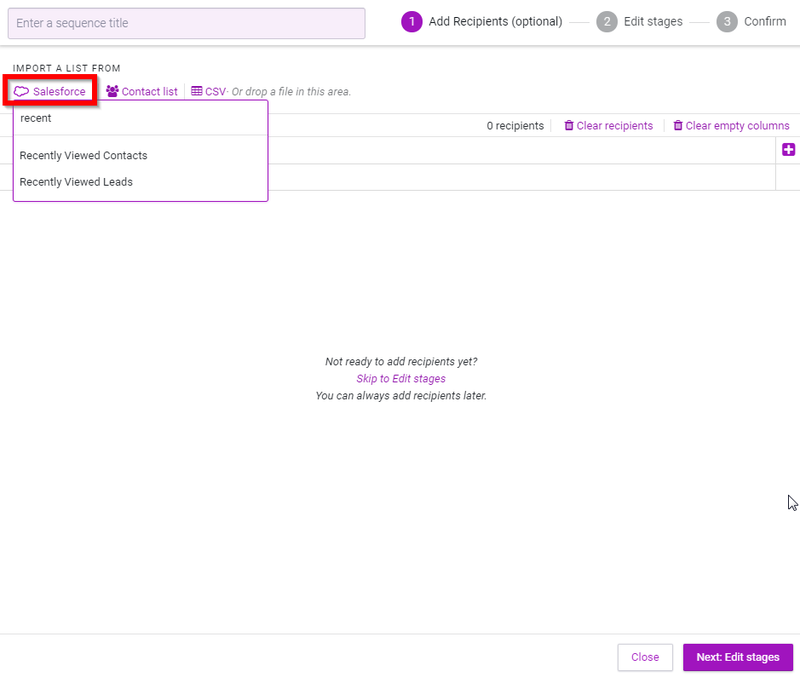 Learn all about our advanced sequence settings under the “Advanced Options” section here: How are recipients removed from a sequence? These settings are not shared with your team. 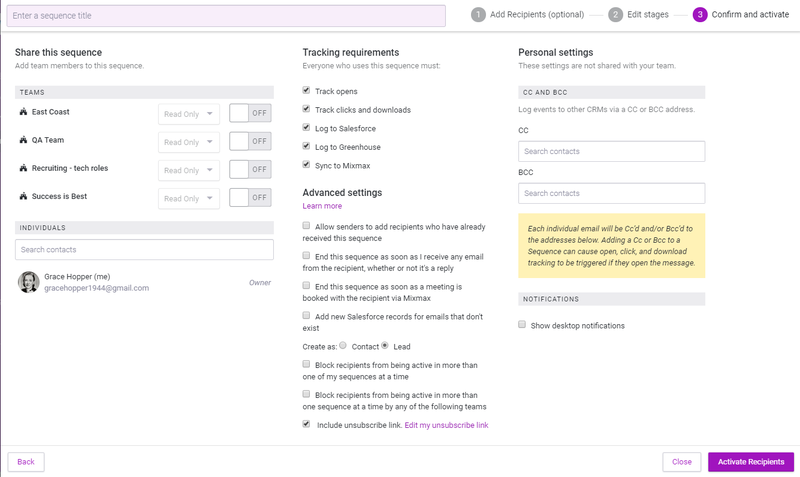 Add a CC or BCC address to log events to other CRMs, or to add a CC or BCC recipient. You can also choose to show desktop notifications. Once you’ve activated your Sequence, you can see high-level reports of its performance from your Sequences page. Learn more here: Sequence and Recipient Reports. Learn how to end an active sequence here: End an active sequence. Learn how to exit particular recipients from an active sequence here: How are recipients removed from a sequence?